Vlogging has been popular for several years now and the trend doesn’t seem to be slowing down. 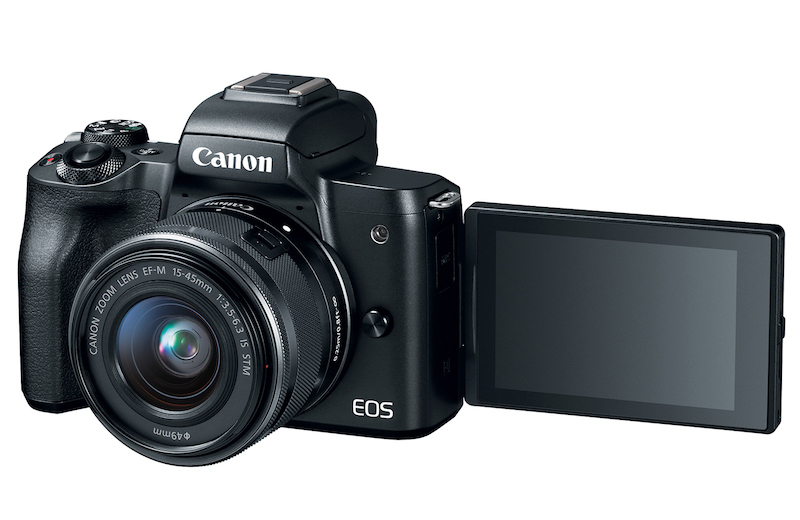 Many vloggers have been using compact cameras or DSLRs to vlog, but lately many are switching to mirrorless cameras. Why? Because they are more compact than DSLRs and offer many more creative possibilities than simple compact cameras and even more than DSLRs in some cases. We made this guide of best mirrorless cameras for vlogging of 2019 to help out aspiring vloggers who are searching for a new camera. So, what makes a great vlogging camera? First and foremost, we believe it needs to have a screen that can flip forward so you can see yourself while recording the video. The camera should also have good autofocus since you’ll be relying on it a lot. We’re in 2019 so it’s also preferable if the camera has 4K video recording option, although it’s not exactly necessary. All other things like slow-motion video capabilities or in-body image stabilization are just a bonus, in our opinion. So without further ado, let’s take a look at some the best mirrorless cameras for vloggers, as well as some lenses we’d pair them with. 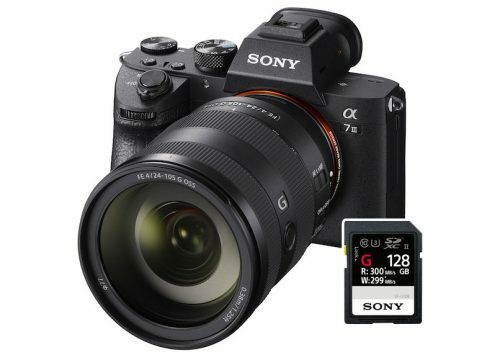 This is the newest camera on our list, as well as the first mirrorless camera released in 2019. Although it is excellent for both stills and video recording, it feels like Sony wanted to please vloggers the most with this one. 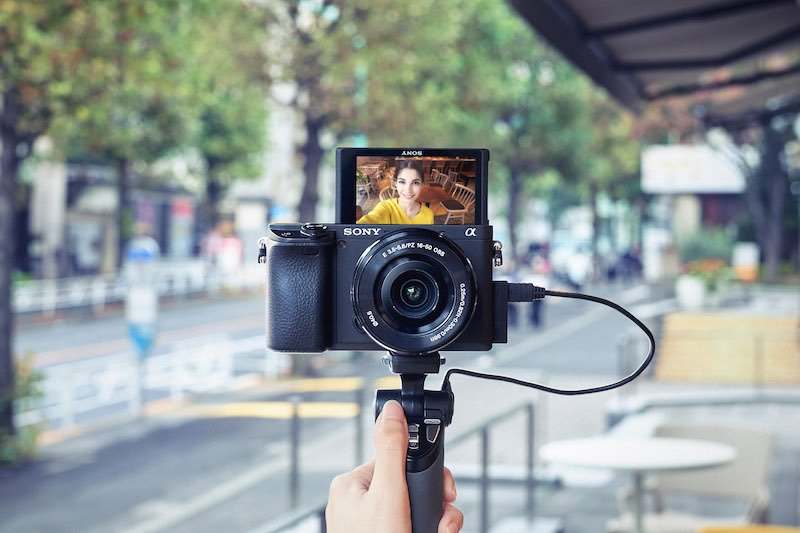 The A6400 has a flip up screen and pretty good built-in microphone, although you also have an option to use your own microphone for better quality audio thanks to the built-in mic input. The camera can record video in 4K at up to 30 fps and the autofocus is blazing fast. In our opinion, Sony A6400 has the most impressive autofocus capabilities out of all vlogging cameras we’re going to mention in this article. Not only does it do a great job of locking on your face when the camera is facing you, but it also has intelligent object tracking capabilities, allowing you to easily track people, animals etc. when you’re behind the camera. It also has 120 fps slow-motion recording mode in 1080p, which is great for B-roll and creative purposes and can take your vlogs to another level. The A6400 uses E-mount lenses, and the selection of them is pretty good. 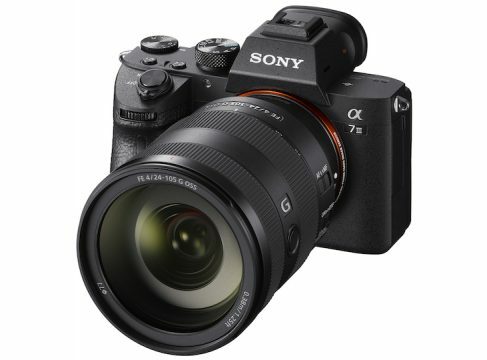 Sony 16-50mm f/3.5-f5.6 OSS kit lens that comes with the camera is decent lens to start with, but when you feel like you want to step up your game, we suggest going with Sony 10-18mm f/4 OSS lens (Get it on Amazon). It is quite a bit wider than the kit lens, allowing you to fit much more in the frame. It also has pretty good stabilization, which means your footage will be quite smooth. We’d also suggest buying a fast prime, like the Sigma 16mm f/1.4 (Amazon) or Sony 35mm f/1.8 OSS (Amazon). Sigma is quite a bit wider, but the Sony can be useful as well, especially if you’re recording someone other than yourself. With that said, both of these lenses will let you achieve nice subject separation with beautiful background blur. Check out our article on best lenses for Sony A6400, if you want to learn more. Finally, Sony A6400 is very small and light, and this is very important when you’re carrying a camera around all day. 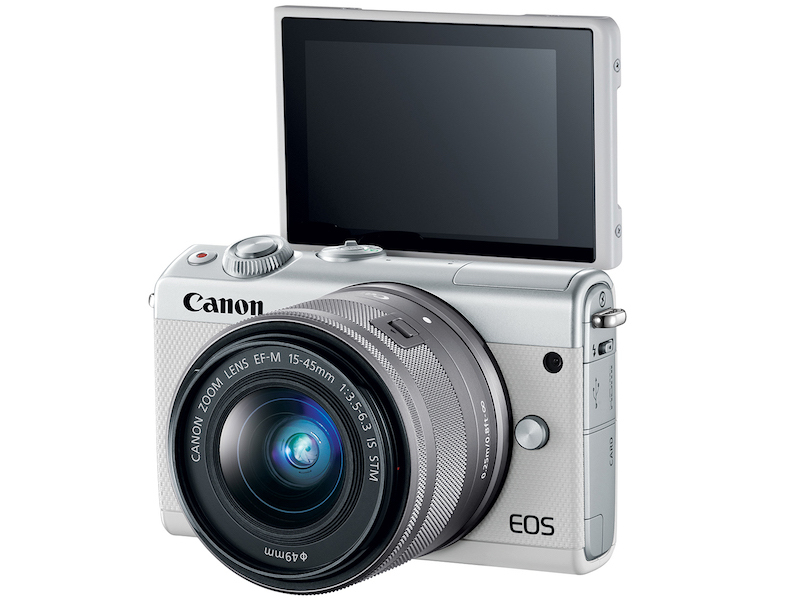 If the A6400 is too expensive for you and you still want amazing autofocus, then Canon EOS M50 is the camera for you. We should note that autofocus is excellent when shooting video in 1080p (thanks to Canon’s Dual Pixel Autofocus), but unfortunately isn’t as great in 4K video recording mode. With that said, if you plan on doing vlogs in 1080p this won’t be a problem. Don’t get us wrong, the autofocus in 4K is still usable, but it’s simply not as reliable and can hunt around occasionally. The camera also has a pretty severe crop in 4K, which means you’ll have to use really wide lenses. This is why we believe it is best to use it to record 108op video. The M50 comes with a fully articulating screen, which is an even better option than the flip up screen on the A6400, because you can angle it however you want. The camera itself is pretty small and compact and most lenses for the EF-M system are pretty tiny as well. Speaking of lenses, the kit lens will be enough for most people to start with, but the Canon EF-M 11-22mm f/4-5.6 IS STM (Amazon) is even better for vlogging due to it being wider. If you want to get creative and play around with blurry background and bokeh a bit, we suggest you also pick up the Canon EF-M 22mm f/2 STM (Amazon) lens. Out of all the cameras on this list, the GH5 is the most expensive one, but it also has the biggest set of features. 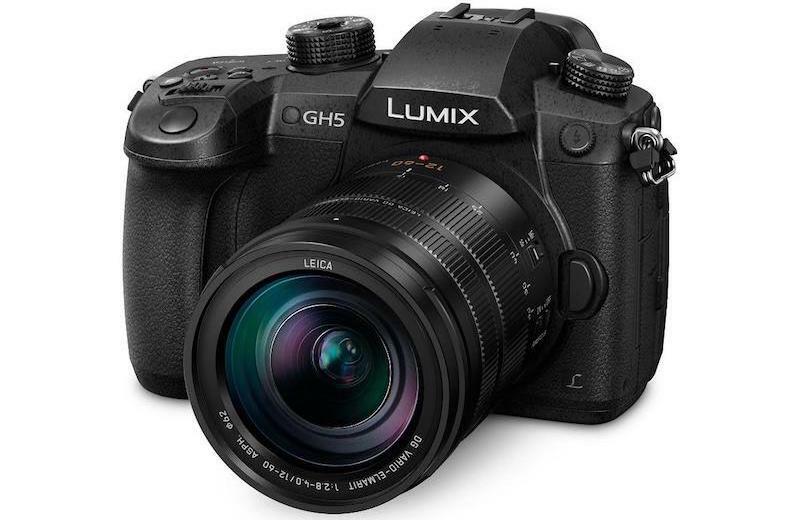 Many videographers use Panasonic GH5 for a lot for commercial video work, and although it isn’t geared towards vloggers that doesn’t mean you can’t actually use it. In fact, one of the most popular vloggers in the world, Casey Neistat, used the GH5 in quite a few of his vlogs. The camera has some pretty impressive features like the ability to shoot 4K video at up to 60 fps and 1080p video at up to 180 fps. This allows for some pretty creative uses that aren’t possible with other cameras from this list. Unfortunately, the autofocus isn’t that great compared to Sony A6400 and Canon M50. The reason is that Panasonic uses a contract detection autofocus system, which lacks any phase detections points. This means that autofocus can sometimes hunt for the subject. However, the GH5 does have a very big advantage over previously mentioned cameras – the in-body image stabilization. Combine it with a stabilized lens and you’ll get really smooth looking footage. The kit lens (Panasonic 12-60mm f/2.8-4) is very versatile and can be used in many different situations. Panasonic 12-35mm f/2.8 IS (Amazon) is another great zoom lens and it’s stabilized as well. If you’re looking for a faster prime lens to help you get some subject isolation and achieve some background blur, you can go with the Panasonic 15mm f/1.7 (Amazon) or Panasonic 20mm f/1.7 (Amazon). 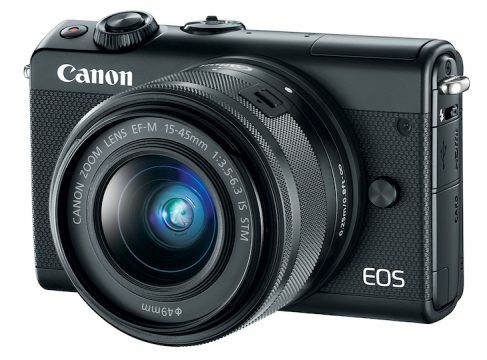 Canon EOS M100 is the best budget option when it comes to mirrorless cameras for vlogging, especially since many stores are offering good discounts on it these days. As you’d expect from a budget camera, there’s no 4K video recording option, but the 1080p video looks pretty good. The camera uses Canon’s Dual Pixel Autofocus, which is accurate and very reliable. Unlike the M50 that has a fully articulating screen, the M100’s display flips up. When it comes to lenses, this camera uses the same mount as the M50, which means that all lenses that we previously suggested will be a great choice for the M100 as well. We should also mention that this is the only camera on our list that doesn’t have a microphone input, which means you’ll be stuck with the built-in microphone. We are also quite fond of the Fujifilm X-T100. The camera features a screen that flips forward from the side of the camera, but it isn’t a fully articulating screen like on the M50 or the GH5. 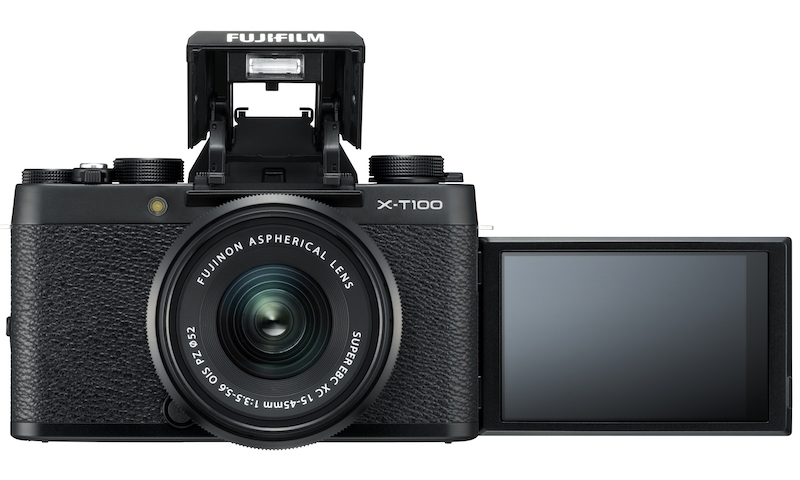 Fuji X-T100 can record video in 4K, but only at 15 fps, making it unusable for vlogging in this resolution. Thankfully, the 1080p video (up to 60 fps) looks really good and the camera has fairly good autofocus, although not up to par with Sony or Canon. One thing that makes Fuji X-T100 stand out from the competition is really great colors straight out of the camera, thanks to a selection of highly praised Fuji film simulations. The camera also has a pretty broad selection of excellent lenses. The kit lens is solid enough for vlogging, but Fuji 10-24mm f/4 (Amazon) would be the best option if money is not an issue. This camera definitely makes sense if you plan on using it for more than just vlogging, and especially if you love taking a lot of photos.